One day, Argentines went to sleep with a plummeting peso and tight exchange controls. The next day, the country awoke to a radical change in the government of Cristina Fernandez de Kirchner's foreign currency policy. After more than two years of increasing restrictions on the purchase of dollars, like taxing credit card transactions abroad or restricting online commerce on foreign websites, Ms Fernandez's chief of staff, Jorge Capitanich, announced that buying dollars for savings accounts would be legal again. From Monday, only those who earn at least 7,200 pesos (about $1,000; £600) a month will be entitled to apply, and be able to buy up to $2,000 a month. There will be a register for those who apply, and Argentines who keep dollars on their account for at least a year will not need to pay a special tax. It was an unexpected announcement and a shocking political reaction to the biggest devaluation of the peso in 12 years - and the biggest crisis of confidence for the Argentine economy since the collapse of the country in 2002. "People are tired," Emanuel, a young banker from Buenos Aires, told the BBC. Like many Argentines, he does not want to give his full name for fear of being investigated by the fiscal authority if he speaks out against government policies. "One week, the government put restrictions on online shopping and now they allow the purchase of dollars; it does not follow a pattern, they contradict each other all the time," he says. Argentina's new economy minister, young Keynesian Axel Kicillof, says the government is worried about the situation, but blames "market speculators" for the freefall of the peso in recent days. The new measure seeks to "create more equity in this exchange market and provide certainty" in the national finances, he said. But the main concern in Argentina is that, unlike most other countries, there is not just one foreign currency market, but two: the official one, where a dollar is worth eight pesos, and an underground system known as "dollar blue", where buyers pay up to 12 pesos for a greenback. Argentines who do not trust their own currency and fear the economy might worsen in coming months usually pay up to 50% more to buy dollars from underground money changers located all over central Buenos Aires, on the black market. They know that with a rocketing inflation rate, currently standing at close to 30%, their pesos might not be worth saving in only a couple of months, so they would rather purchase dollars, even though this had been illegal up until now. "I do not think this is good news," says Liliana, 58, from Buenos Aires. "Traders will suspend sales or increase prices to cover the cost of devaluation," she says. Indeed, the rising inflation is the main concern for Argentines. Some electronics stores had already stopped displaying the prices of television sets, computers and home appliances on Friday, as they feared the new value of the peso would have an impact on all imported goods. Travel agents say they are putting some holding bookings on hold, as tourists start to get nervous about the situation in Argentina. And yet there is another concern for national economists. 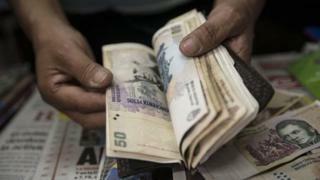 Argentina's reserves of hard currency dropped by 30% last year. Despite the government's efforts, Argentina's reserves are now below $30bn - their lowest level since 2006. The government hopes that the coming soy and cereal crops, one of the main sources of revenue for Argentina, will help ease the pain. "This is not as worrying as it was in 2001 or 2002, but we are facing testing times," Gerardo, 47, from Buenos Aires, says. Like him, many fear the cocktail of rising prices and the worrying shape of the foreign reserves could put the economy on the brink once again.